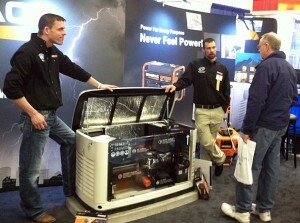 • On Sunday at 1 pm, Essexville Electric’s Don Blakely will be presenting an informational seminar on generators. Come get all your questions answered! • Throughout the weekend, if you sign up for a FREE in-home generator consultation you will be entered in a drawing for a Generac power washer giveaway. This is a great oppotunity to get a one-on-one consultation, but don’t delay, consultations should be scheduled by April 24th to be entered in the drawing. • Lastly, our “Home Show Special” is 5% off your whole house or portable generator installed in 2015! Just stop by booths 7, 8, & 9 and talk to a team member to receive this discount, offered only at the home show. The show runs 4 – 8pm Friday, 9 am – 6 pm Saturday, and 11 am – 4 pm Sunday. The event is hosted by Northwood, in the Hach Student Activity Center, 4000 Whiting Drive. The cost is only $4.00 for adults, $3.00 for seniors and free for kids. The Essexville Electric team is looking forward seeing you during the Home & Garden Show this weekend, it will be a great event!